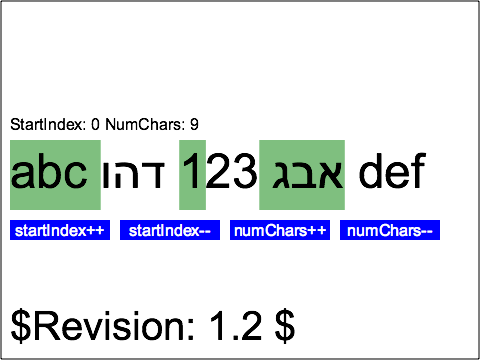 the space between "c" and "ו"
the space between "3" and "ג"
If only the substrings listed above were selected then the test has passed. A user agent that allows selecting text in logical order would have generated the same selection as in this testcase if the user started the selection on the character "a" and ended it on the character "1". A user agent that allows selecting text in visual order would not have a discontigous selection if the user started the selection on the character "a" and ended it on the character "1". The copied text would be discontigous instead in this case. Note that the SVG DOM method requires logical order text selection, so for both types of user agents this testcase must look the same. The testcase also shows what happens when the selection is modified via DOM (click the buttons below the bidi-text). Compliant viewers must throw an exception when the first parameter handed to SVGTextContentElement.selectSubString is out-of-range. That means the variable 'startIndex' must always be in the range 0 <= startIndex <= 18. 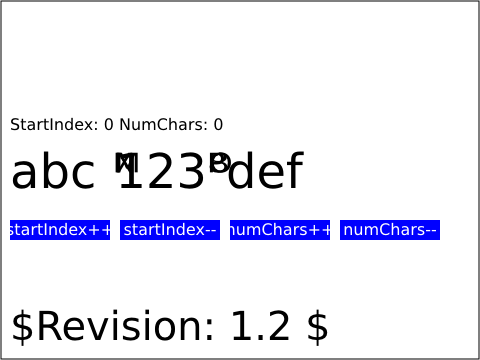 It can be noted that the parameter 'numChars' is not restricted in this way. Note that the color of the text selection is UA dependent and not defined in the SVG specification.